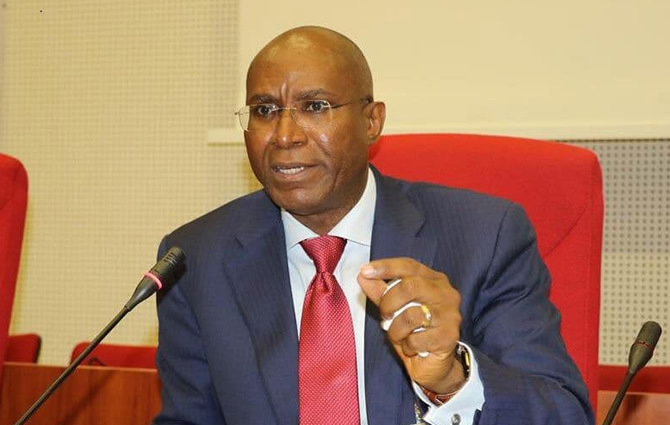 Sen. Ovie Omo-Agege (Delta Central-APC) has restated that his reelection victory in the Feb. 23 National Assembly poll remained valid and legitimate. Omo-Agege, who represents Delta Central Senatorial District, said this on Monday in a statement signed and released on his behalf by Nath Dotie. Recall the Court of Appeal sitting in Benin, had on March 29, upheld the earlier judgment delivered by the Asaba Federal High Court which nullified the Jones Erue-led APC state executive committee. However, the senator who is contending for the post of the Deputy Senate President in the incoming Ninth Assembly insisted that not being a party in the Asaba matter, the Asaba judgment has no legal effect on him. NOT A PARTY IN THE DELTA APC LEADERSHIP LEGAL TUSSLE, SENATOR OVIE OMO-AGEGE DID NOT LOSE ANY “APPEAL”. 1.0. On March 18, 2019, Hon. Justice Toyin ADEGOKE of the Federal High Court, Asaba gave a judgment in Suit No: FHC/ASB/CS/76/2018 which supposedly recognised Chief Cyril Ogodo and persons under him as executives of the All Progressives Congress (APC) in Delta State, instead of the present executives of the party led by Prophet Jones Ode Erue – executives duly recognised by the National Working Committee (NWC) of the APC. This judgment is in violent conflict with the valid, unchallenged and subsisting June 18, 2018 judgment of Hon. Justice Chikere of the Federal High, Abuja in Suit No. FHC/ABJ /CS/509/18 which validated, recognised and gave legal life to the Prophet Jones-led executives of the party – a judgment that the plaintiffs in the Asaba court have failed to set aside/appeal against. 2.0. Although the narrow issue before the Asaba Court is the leadership question of the APC in Delta State and given that no contestant in the 2018 primaries of the party in Delta State was a party to the action, Justice ADEGOKE nonetheless made pronouncements that ostensibly touch on the rights of the contestants in the said primaries in their absence. Indeed, the said judgment seems to curiously target, for maximum harm, the rights of persons who were shut out of the case by questionable declinature of otherwise simple applications to join the action to defend their threatened rights. 3.0. As it is, the APC and Prophet Jones (as Respondents) have filed appeals against Justice ADEGOKE’s judgment. Chief Great Ovedje Ogboru (APC’s Governorship Candidate in the 2019 General Election) has also filed an appeal to set aside the entire proceedings and judgment of the lower court on the ground, amongst others, of the Court’s perverse rejection of his application to be joined as a NECESSARY PARTY in the matter to allow him to defend his threatened interests. We commend the appellants who, apparently protecting the Abuja judgment as a PERMANENT LIGHTNING ROD OF DEFENSE against anarchy, nuisance, malevolence, rascality and corruption, now want the appellate court to set aside the lower court’s proceedings/judgment in their entirety. 4.0. It is elementary that the Federal High Court, whether in Abuja or Asaba, is the same and of coordinate jurisdiction nationally. The Asaba Court has no appellate authority to override or set aside the valid, subsisting and final (being now unappealable) judgment of the Abuja Court. To the extent that the Asaba Court somehow clothed itself with false appellate power to review the Abuja judgment, including delving into questions of issues estoppel and re judicata, the Asaba judgment looms large as a deliberately orchestrated effort to concoct and stoke avoidable anarchy, as desired by sponsored agents of elements who are laboring to undermine APC’s interests in Delta. b. KOKORO-OWO v. LAGOS STATE GOVERNMENT, wherein the Supreme Court, per BELGORE, JSC, also stated without ambiguity that: “A party to be affected by a decision must not be left out of the action because no Court will make an order against any person who has not been heard or given opportunity to be heard.”  11 NWLR (PT 723) 237. 6.0. Yes, consistent with the clear position of the law, the Distinguished Senator Ovie Omo-Agege has stated repeatedly that not being a party in the Asaba matter, the Asaba judgment has no legal effect on him. This position was pretty much validated when the Appeal Court, Benin declined his recent APPLICATION FOR LEAVE TO JOIN the appeals in the spirit of camaraderie to give more intellectual teeth to the appeals – appeals that will most likely terminate at the Supreme Court. Although not different from what happened in the OKONTA case (above), the wise Noble Lords of the Court of Appeal declined the APPLICATION FOR JOINDER (not an APPEAL). It is however noteworthy that this declinature has nothing whatsoever to do with the substantive appeals, but there are fake news and mischievous media hysteria that give a false impression that an ‘APPEAL’ was lost! 7.0. Finally, maybe it needs to be said that to the extent that all Delta APC candidates in the 2019 General Elections are directly or indirectly connected to the judicially approved executives of the party under Prophet Jones (vide the valid, binding, unchallenged and subsisting Abuja judgment), their candidacies remain intact and cannot be questioned, except by a final judgment of a superior court setting aside the same Abuja judgment. As of today, that seems an impossibility.